On Thursday night I crossed another of my favourite bands of all time off of my ever-growing list of artists to see in concert: INTERPOL (Photo courtesy of mashishka’s Flickr). As usual, I have no regrets spending money on somewhat pricey concert tickets instead of… food, or whatever, when the entire night burns itself indelibly into my memory for future reference of awesomeness. And then. Cue fog, dramatic lighting, well-dressed men on stage with guitars – all excellent things in life, especially that last one. By this point I was basically bouncing up and down like a kid who’d eaten a bag of Halloween candy. 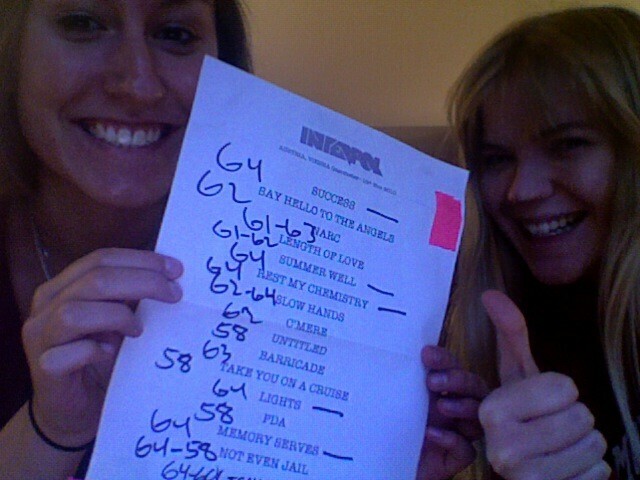 Mink was dreadfully sick, but to her infinite credit she rallied enough to see Interpol with me and absorb some of my excitement. I’ve never gone to a concert alone, and I think I would have no problem doing it except for the fact that I love sharing the excitement of the adrenaline rush that comes from witnessing music being created. As for that thing about wanting to get the setlist for every concert I go to… We didn’t have much hope, as there’s a huge fence a couple of feet away from the stage at Gasometer, but we stormed that fence like champions to get the attention of the guys dismantling the stage. I suggested (rather forcefully) that one go up on stage and get one for us, but he ignored my request. Thankfully some other dude was handing a few out and strode over to where we were wildly gesticulating like he’d spotted us from up on stage. As we rode home on the U-bahn, the only thing I was thinking: I can die happy, once I’ve seen Radiohead.